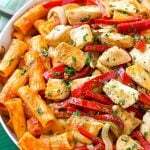 This recipe for chicken riggies is sauteed chicken with peppers and rigatoni pasta, all tossed in a creamy tomato sauce. 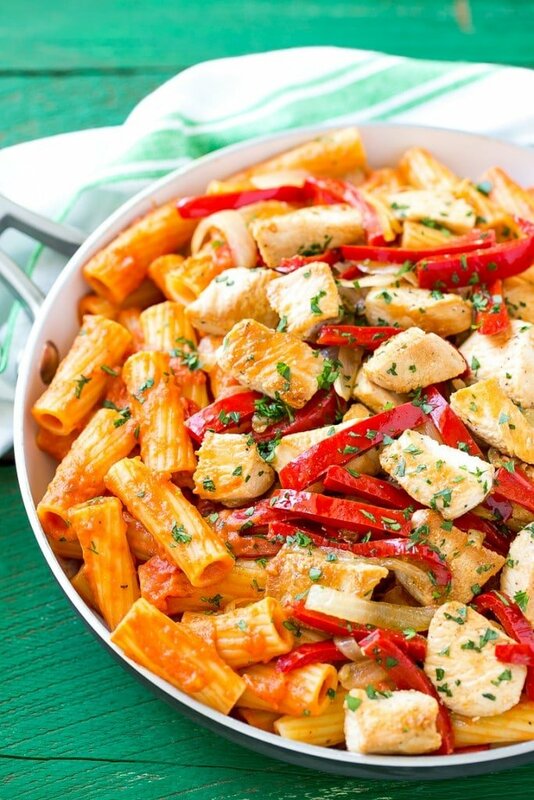 This spicy chicken rigatoni dish is pure comfort food and can easily be doubled to serve a crowd! I love a hearty pasta dish, some of my favorites include chicken parmesan pasta, lemon asparagus pasta and this zesty chicken riggies recipe. I was at a local restaurant the other day and they had a dish on the menu that was called chicken riggies. Curiosity got the best of me and I ordered it, what a great decision that was! I liked it so much that I decided to recreate the recipe at home. 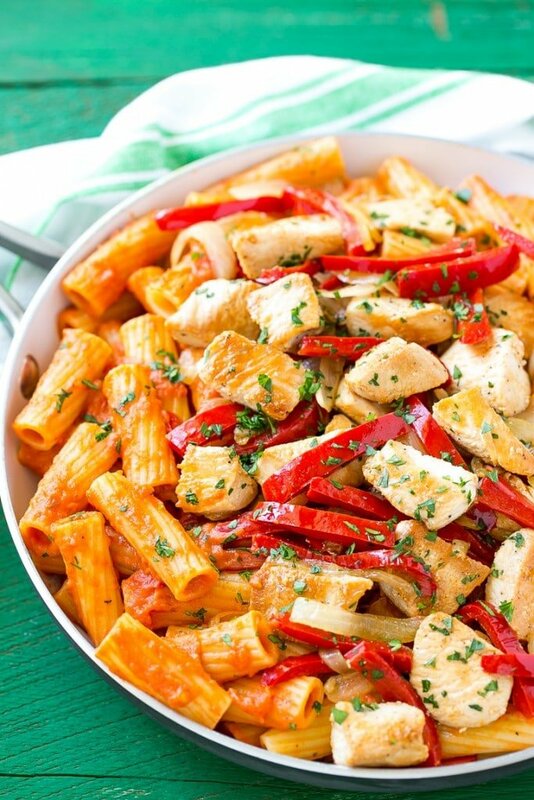 Chicken riggies is basically a spicy chicken rigatoni pasta that’s very popular in the state of New York. 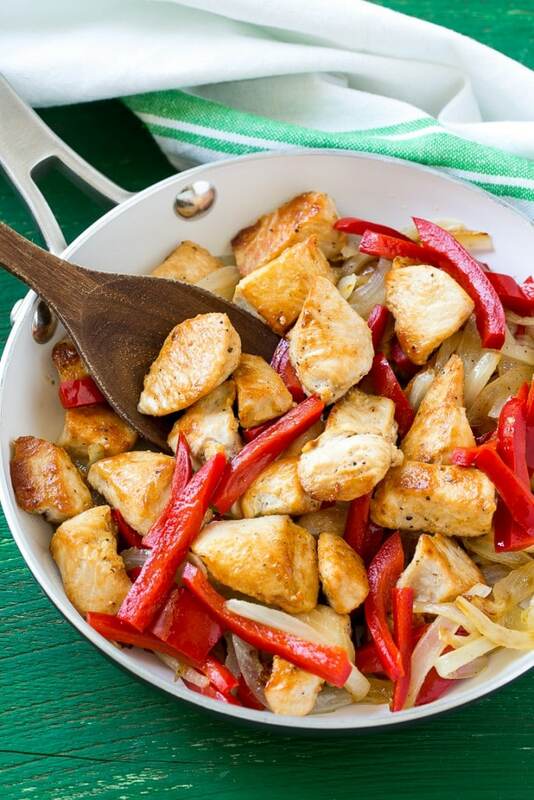 This dish is full of sauteed chicken, onions and peppers which are served over pasta that’s been tossed in a creamy tomato sauce. 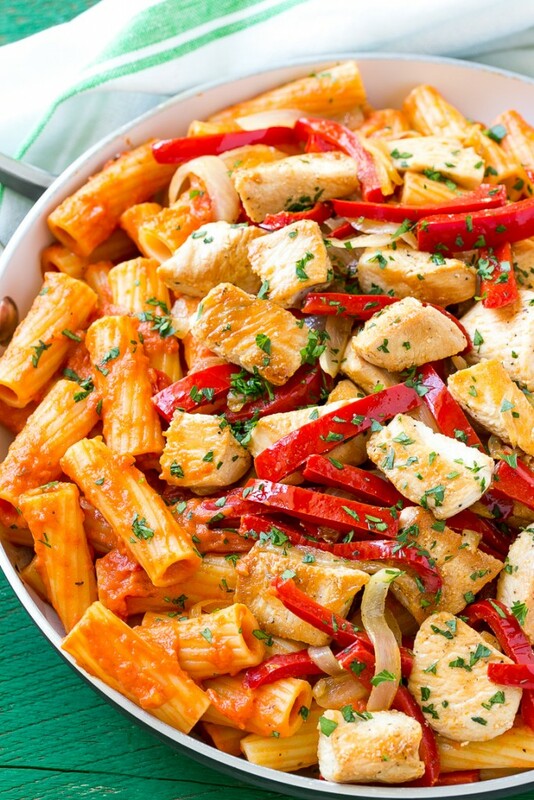 For this chicken riggies dish, you need diced chicken, both hot and sweet peppers, and onions. For sweet peppers, I use red bell peppers, although yellow or orange will also work just fine. For the hot peppers, I use hot cherry peppers which come jars and are often sold in the pickle and olive area. The cherry peppers really elevate this dish from your typical pasta with peppers, so make sure to include them! I put the pasta on the stove to boil and while it’s cooking, I saute my chicken, peppers and onions until they’re golden brown and tender. After the chicken and peppers are done, it’s time to put together the sauce. I always use a jarred sauce to save time, but not all jarred sauces are created equal! 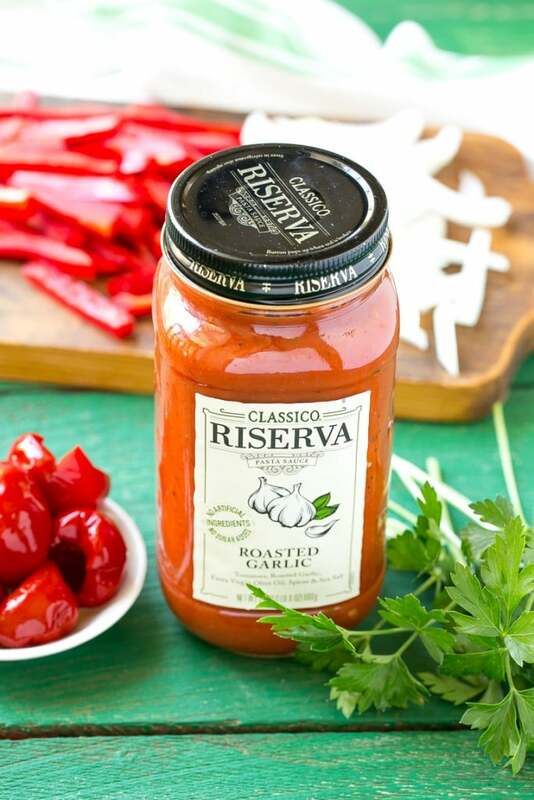 I stumbled upon the new Classico Riserva Pasta Sauce and it’s now my go-to sauce. It tastes homemade because it’s slow simmered to perfection, with vine ripened tomatoes, herbs and spices, extra virgin olive oil and a bit of sea salt. I also love that the sauces are made with no artificial ingredients or added sugar. Classico Riserva sauces come in 5 different flavors, in this dish I used the Roasted Garlic flavor to amp up the flavor of the chicken riggies. Opening a jar of great pasta sauce is almost like opening a nice bottle of wine – you want the good stuff! The sauce for the chicken riggies is a whole bottle of Classic Riserva Pasta Sauce along with a bit of cream. The sauce gets tossed with the pasta and chicken mixture to create an exceptional dinner without a ton of effort! You can add a little parsley like I did here, and be sure to serve your pasta with some freshly grated parmesan. Feeding a crowd? This recipe can easily be doubled to feed a house full of people. Just add a side salad and perhaps some garlic bread and you’ll have an Italian feast! 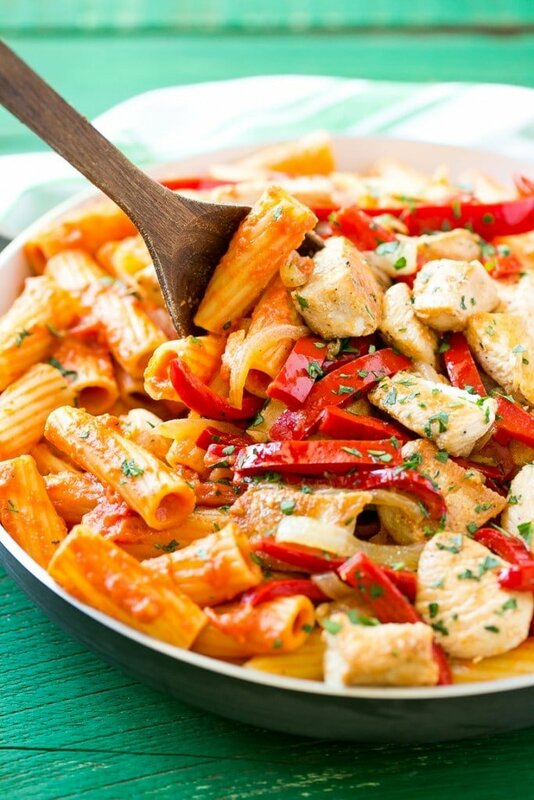 Once you try this chicken riggies pasta, you’ll find yourself making it on a regular basis. That combination of golden brown chicken with assorted peppers just can’t be beat. This is a must-make recipe! In a large pan heat 1 tablespoon of oil over medium high heat. Add the onion and bell pepper and season to taste with salt and pepper. Cook for 5-7 minutes or until vegetables have browned and softened. Stir in the cherry peppers and remove the mixture from the pan. Bring a large pot of salted water to a boil. Place the rigatoni in the water and cook according to package directions. Wipe the pan out with a paper towel and heat the remaining tablespoon of olive oil over medium high heat. Add the chicken and season generously with salt and pepper. Cook, stirring occasionally, until chicken is browned and cooked through, 6-8 minutes. Add the pepper mixture back to the pan with the chicken. Pour the pasta sauce over the chicken mixture and stir to coat. Bring the sauce mixture to a simmer; add the heavy cream and stir until incorporated into the sauce mixture. Simmer for 3-4 minutes. Drain the pasta and return it to the pot. Pour the chicken and sauce mixture over the pasta and toss to coat. Sprinkle the parsley over the top and serve with parmesan cheese if desired. I made this for dinner a couple of nights ago and it was delicious. I altered the recipe by using rotini pasta, chili flakes instead of hot cherry peppers, and omitted the parsley. I added a lot of parmesan cheese.